Today is Samoa’s Big Day; I’d call it the Biggest Day since their independence over fifty years ago. 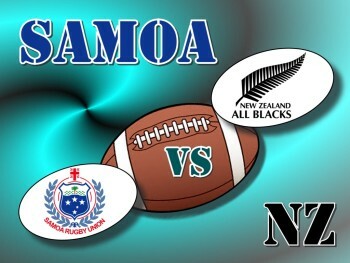 The world champion All Blacks are playing Manu Samoa [rugby] at 3.00pm local time, their first visit to Samoan soil. This is a huge event here for a passionate people who have produced many of the All Black greats, but who have been snubbed by the IRB for years. Rugby, for those not familiar with the sport is a religion in my country of birth, New Zealand and Samoa (where I reside now). Take American Football and cut the stoppages by 75% so that you have more of a flowing game; then take off the pads and protection gear [only sissies and Americans need those) and you have a bone-crunching eighty minute thriller that would be the envy of many a Caesar. Legalised violence balancing skill and fitness for 80 minutes of action. I enjoy watching rugby, the TV coverage nowadays is excellent – especially for a guy who likes to see patterns and likes to see the strategy of team against team. I won’t be watching this game though, for my Aerial is still on the roof at Satapuala and while the TV works, I haven’t watched it in four years! The government of Samoa has pushed through with good infrastructure improvements in the last decade, and when the All Blacks were billed to appear in person, their upgrade to Apia Park has put the cherry on the top of the developments, with bigger better stands, lights and a massive screen. While the countries debt has blossomed well past its capacity to ever repay [like many countries, especially those of the third world] I do appreciate the developments. The villages of Samoa are really turning it on – flags line the road from Faleolo Airport to Apia, most villages are doing something even in Savaii. Samoa really does this well – it’s one of the things I really love about the country. I struggle to think of any Bigger Days in Samoa’s recent history – The Tsunami of September 2009 and Independence in 1962 are two others, but for Samoa, to have the world champion All Blacks play a test match against Manu Samoa for the first time on home soil is quite extraordinary. Remember that these are the world champions and Samoa is a tiny island nation of only 180,000! The decision for the ABs to visit has been discussed ad infinitum elsewhere and there are people who really deserve a lot of credit for making it happen – Manu Samoa supporters, the Prime Minister Tuila’epa and the All Black management who have bitten the bullet and shown that there is a little heart in what is essentially a money-making machine. They could make a lot of moolaa elsewhere but Samoa is all about people and relationships and this visit will not be forgotten in a hurry. Helen Clark, Prime Minister of New Zealand at the time apologised to Samoa a few years back for New Zealand’s past indiscretions, and there was a bit of commentary in New Zealand about it along the lines that what she was a good thing. At the time, I just thought, “Ho hum!” but having lived here and come to understand and appreciate the Samoan ways, relationships are VERY important to the Samoans and what she did was the right thing to do. Likewise with the ABs visiting. No matter the score today, this is a win-win event, for sure! For Samoa to host the mighty Blacks is a win for Samoa. Gracing us with their presence is a win for New Zealand and the All Black team. I don’t gamble but I’d be taking money from many-a-Samoan who believes that Manu has a chance. I doubt it. I was speaking to guy a day or so ago in town who was puzzled that I didn’t rate the local team. “But Dennis, the local boys, at home, with the crowd behind them, a historical event; our boys can do it!” he was saying. I told him that I always say to people when talking about Samoans that while their physique is amazing and “Give a Samoan a rugby ball and tell him to ‘Go!’ and there’s nothing on the planet can stop him”, that they won’t be bowling the world champions! Maybe the humidity will take the edge off the AB’s fitness edge but the ABs are number one for very good reason – they are a clinical professional team in every regard. Manu Samoa is basically a collection of passionate boys with top ball skills and physique scratched together to try to make a team. They lack in the strategy department, and always will – it’s a cultural thing, [don’t ask!]. I think that the AB’s might be a bit bruised and battered after the game and discipline may also be an issue for the Blues because they’ll be all hyped up. TIP: Stay well clear of a hyped up Samoan! They do really well with their best players playing in all four corners of the world, in fact incredibly well, but my money today is on Black, not Blue. My prediction is NZ by 30, probably even 40 points. If it’s less then I’d take my hat off to Manu Samoa, they will have done well. On a good day they might just foot it with some of the best, but it would have to be a sequence of miracles, not just one to bowl the AB’s over today. UPDATE: Samoa 16: New Zealand 25. Thanks to the Sydney Morning Herald for a very classy realtime updating web page game commentary with images and video snippets too. Despite getting rattled at the start the All Blacks in the end were too good but hey, what passion from Blue!